U.S. Transportation Secretary Ray LaHood today awarded a $196.5 million grant to the Michigan Department of Transportation (MDOT) for track and signal improvements between Detroit and Kalamazoo, MI. These improvements will allow for speeds up to 110 mph on 77 percent of Amtrak’s Wolverine and Blue Water services between Detroit and Chicago, resulting in a 30 minute reduction in travel time between those destinations. Dollars for this 135 mile segment between Detroit and Kalamazoo will support preliminary engineering, final design and construction. The project includes new, continuously welded rail and ties, fiber optic lines and infrastructure to support a positive train control system, rebuilding 180 highway-rail grade crossings, and gates and flashers at 65 private highway-rail grade crossings. The project will create approximately 800 new jobs during the construction phase, which is expected to begin late spring 2012, and will facilitate service to current and future freight rail customers, including major shippers like Ford Motor Company. In addition, MDOT is designated to receive $150 million DOT grant later this year to purchase this 135 mile segment of track, when grant conditions are met. This will allow for the implementation of 110 mph service along the corridor that will bring improved passenger service, ensure capacity for freight operations through double tracking on the busiest freight segment and deliver long-term economic benefits to the State of Michigan. The Wolverine and Blue Water routes are part of the Midwest rail network, which has a population base of about 29 million people 100-500 miles from one another. Midwestern states have been working cooperatively together to plan and further develop an integrated, multi-state passenger rail network. In addition to the goal of expanding service to new cities, trains in the system will travel at 110 mph on the primary routes and 90 mph on secondary lines, reducing travel time, and increasing reliability and on-time performance. WASHINGTON – In celebration of Amtrak’s 40th anniversary, America’s Railroad(sm) is offering the public an opportunity to view an Exhibit Train, a unique traveling display showcasing the railroad’s history. The free exhibit showcases Amtrak history over the decades, displaying memorabilia like vintage advertising, past menus and dinnerware, and period uniforms. Most locations also will feature train-themed kids’ activities at Chuggington Kids Depot. June 25 – 26: Strasburg Rail Road*, Lancaster, Pa.
July 9 – 10: Springfield Amtrak Station, Springfield, Mass. July 16 – 17: New Haven Union Station, New Haven, Conn.
July 23 – 24: New London Union Station, New London, Conn.
July 30 – 31: Providence Amtrak Station, Providence, R.I.
Aug. 20 – 21: Main Street Landing, Burlington, Vt.
Aug. 27 – 28: Albany Amtrak Station, Rensselaer, N.Y.
Sept. 3 – 4: Steamtown National Historic Site*, Scranton, Pa.
Sept. 24 – 25: Galesburg Amtrak Station, Galesburg, Ill.
Oct. 8 – 9: Jackson Amtrak Station, Jackson, Mich.
Oct. 29 – 30: Portland Amtrak Station, Portland, Ore.
*Chuggington Depot is not available at Strasburg Rail Road or Steamtown National Historic Site events. Note: Hours of operation are 10 a.m. to 4 p.m., except Strasburg Rail Road events which opens at 9 a.m., and Steamtown National Historic Site which is open from 9 a.m. – 5 p.m. In addition, commemorative 40th anniversary merchandise will be available for purchase onboard the train including: Amtrak: An American Story, a144-page commemorative book that chronicles the history of the railroad with archival photographs, a historical timeline and personal narratives for each decade; Amtrak: The First 40 Years, a documentary DVD produced for public television that provides an exclusive look inside America’s Railroadsm with hard-to-find photographs and video footage as well as interviews with past and present leaders; and a commemorative cachet (envelope) that bears a special pictorial postmark authorized by the United States Postal Service. Celebrating 40 years of dedicated service as America’s Railroad(sm), Amtrak is the nation’s intercity passenger rail provider and its only high-speed rail operator. A record 28.7 million passengers traveled on Amtrak in FY 2010 on more than 300 daily trains – at speeds up to 150 mph (241 kph) – that connect 46 states, the District of Columbia and three Canadian Provinces. Amtrak operates trains in partnership with 15 states and four commuter rail agencies. Amtrak also is a strong financial performer achieving an 85 percent cost-recovery ratio in FY 2010. Enjoy the journeysm at Amtrak.com or call 800-USA-RAIL for schedules, fares and more information. Join us on facebook.com/Amtrak and follow us at twitter.com/Amtrak. Former Congressman Dr. John J.H. 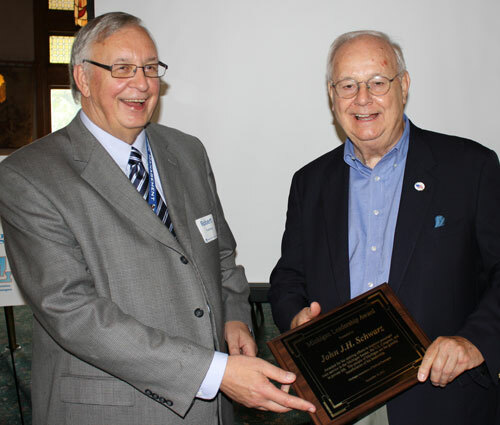 “Joe” Schwarz has been honored for his work to improve and expand passenger train services in Michigan. The “Michigan Leadership Award” was presented to Schwarz by Robert Tischbein, chair of the Michigan Association of Railroad Passengers, at the group’s 38th Annual Meeting held Saturday at Clara’s On the River in Battle Creek. A lifelong train enthusiast, Schwarz has played important roles as a state legislator, a Congressman, and a private citizen. Schwarz has long recognized modern and efficient train service as an economic development tool and a provider of jobs. He has advocated for trains as a vital component of a safe, convenient and energy efficient transportation system that provides access to business, tourism, and educational venues for travelers of all ages and income levels. Schwarz was recently appointed by Governor Snyder to represent the public on the Midwest Interstate Passenger Rail Commission. His keynote address to the rail passenger’s group detailed the initiatives of this eleven-state compact to promote, coordinate and support improvements to passenger rail service throughout the region. Michigan Flyer — the airport shuttle service of Indian Trails, Inc., and Okemos Travel — plans to add a new I-96 route this fall, doubling the number of trips it makes each day between East Lansing and Detroit Metropolitan Airport. Currently, Michigan Flyer offers luxury motor coach service along the I-94 corridor between East Lansing, Jackson, Ann Arbor and Detroit Metro. To establish the new route on the I-96 corridor between East Lansing, Howell, Brighton, and the Detroit airport, Michigan Flyer is seeking a one-time grant of $1.5 million from the federal Transportation, Community, and System Preservation Program (TCSP) to help fund start-up operations. The new route is expected to become self-sustaining in its second year of operation. To begin the new route, Michigan Flyer would contribute $390,000 in matching funds/in-kind value toward operations and invest $1.5 million of its own funds to purchase three new luxury motor coaches. The TCSP Program funds public-private partnerships to improve the efficiency of the transportation system, reduce environmental impacts of transportation, reduce the need for costly future public infrastructure investments, and ensure efficient access to jobs, services and centers of trade. According to the U.S. Department of Transportation and studies by many other authorities, public-private partnerships in transportation often result in significant cost savings, shorter project development times, less public sector financial, operational, and maintenance risk, and greater innovation. Indian Trails and Michigan Flyer are privately owned providers of public transportation services. A significant percentage of Indian Trails inter-city routes statewide are subsidized by the State of Michigan. The Michigan Department of Transportation (MDOT) is sponsoring Michigan Flyer’s application for the TCSP grant. Michigan Flyer plans to begin the new service as early as Nov. 15, 2011, to serve the public during the peak holiday travel season. The new I-96 project cannot proceed without the TCSP funding. In addition to MDOT, Michigan Flyer’s grant application is supported by Sen. Debbie Stabenow, Rep. Mike Rogers, officials at Michigan State University and University of Michigan, the Michigan Environmental Council, Michigan Association of Railroad Passengers, and communities along the I-96 corridor. On July 5, the Capital Area Regional Transportation Study (CARTS) committee of the Tri-County Regional Planning Commission voted overwhelmingly to recommend planning commission support for Michigan Flyer’s proposal by adding it to the “illustrative list” of transportation improvement projects for TCSP consideration. The planning commission is expected to act on the proposal at its July 27 meeting. Indian Trails, Inc. — which has served as Michigan’s premiere, family-owned, inter-city motor coach carrier for more than 100 years, and is based in Owosso—operates one of the largest and newest fleets of deluxe motor coaches in Michigan. Its services include charters, tours, shuttles, airport transfers, casino runs and daily scheduled routes throughout Michigan and into Chicago and Milwaukee. On the web at http://www.indiantrails.com/. The Michigan Flyer — whose motto is “Why Drive?” — offers affordable, seamless, luxury motor coach connections between Lansing, Jackson, Ann Arbor, and Detroit Metro Airport. Jointly owned by Indian Trails and Okemos Travel, Michigan Flyer has carried nearly 400,000 passengers since its launch in November 2006 — and has achieved an extraordinary 99 percent rate of on-time arrivals and departures. On the web at http://www.michiganflyer.com/. Washington, D.C. and Lansing, MI – By 2015, more than 15.5 million Americans 65 and older – nearly a half-million of them in Metropolitan Detroit and hundreds of thousands in other regions of Michigan – will live in communities where public transportation service is either poor or non-existent, a new study shows. That number is expected to continue to grow rapidly as the baby boom generation ages in suburbs and exurbs with few mobility options for those who do not drive. The report, Aging in Place, Stuck without Options, ranks metro areas by the percentage of seniors with poor access to public transportation, now and in the coming years, and presents other data on aging and transportation. It ranks Metro Detroit as tied for third from the bottom among major cities when judging seniors’ projected access to public transportation by the year 2015. An estimated 68 percent of Detroiters will have “poor” access, the report concludes. That ranks only ahead of Atlanta (90 percent) and Riverside-San Bernadino CA (69 percent). “The bad news isn’t surprising – Detroit is near the bottom when it comes to providing transportation options to its residents, including senior citizens,” said Tim Fischer of the Michigan Environmental Council. Other Michigan regions and the percentages of seniors who will lack access to public transportation include: Grand Rapids-Muskegon-Holland (78 percent); Kalamazoo-Battle Creek (69 percent); and Lansing-East Lansing (60 percent). Kafantaris added the report indicates “this is the worst possible time” for Detroit City Council and other municipal governments to consider cutting transit funding. Include a “complete streets” policy to ensure that streets and intersections around transit stops are safe and inviting for seniors.